If you're not in Ireland you may not be aware of the fact that we're having a drought here. If you are in Ireland you are absolutely, 100% certain we are NOT having a drought. Yet, despite what now seems like weeks of daily, heavy rain showers, we have water shortages. There are times when Irish people use the expression "only in Ireland" when it's definitely not "only in Ireland." News about corruption in politics? "Only in Ireland" you'll generally hear, but that's certainly not true. All democracies experience corruption and Ireland is actually ranked better than most. However, the other day I was watching the news headlines with a friend when the newscaster mentioned our water shortage and my friend looked at me and said, "Only in Ireland would you have water shortages in such weather." I couldn't disagree. It was raining at the time and, in fact, I couldn't recall the last time we had had two straight days without rain. Yet I also couldn't argue with the evidence just presented on the television of a reservoir that was far from full. The report was thanks to Dublin City Council's warning asking people to conserve water. They asked us not to water our lawns. Well, no argument from me because ... God's got that one covered! I really don't understand how we could possibly have a water shortage. I know we had a (relatively) dry spring, but come on. It has hardly been Phoenix here. According to the official records, Dublin had only about 60% of the normal amount of rainfall during the spring. But let's face it, 60% of Dublin's normal rainfall is still a lot of rain. There are many cities on Earth that would love to get 60% of Dublin's normal rainfall. This is one of those examples where you can see how the Celtic Tiger years were truly wasted. The city of Dublin grew rapidly during the time, but the water infrastructure wasn't improved or expanded as the city grew. Nearly a quarter of all the water pipes in Dublin are 75 years old or more. They leak. A lot. That's one source of our shortage. On top of that we need new reservoirs. The city grew, but the supply of water didn't. We're near the point where demand equals supply. 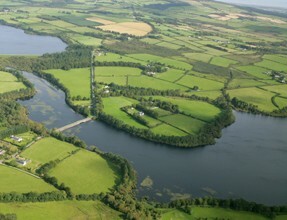 There are plans to draw water from the Shannon, among others, but nothing is definite yet. The only definite is that the government wants to meter and charge for water. I can see their point, but imagine how much easier it would have been if they government had actually tackled this when the coffers were overflowing rather than just jacking up public sector pay? Now every household is going to be expected to pay for water, which has been free up to now, just when many households are drowning in debt. That's how we find ourselves this June in a Dublin soaking in rainwater, its citizens being asked to conserve because the reservoirs are short of supply. Only in Ireland.